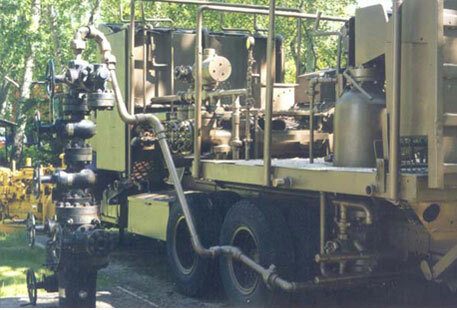 Typical small wireline unit used during the 1950's and 1960's to service Canadian oil and gas wells, many of which were hot, sour and deep. Rebuilt and restored by: Matts Manufacturing Ltd., Calgary, Alberta and Earl Nordell and his Plains Perforating Ltd. staff in Nisku, Alberta. 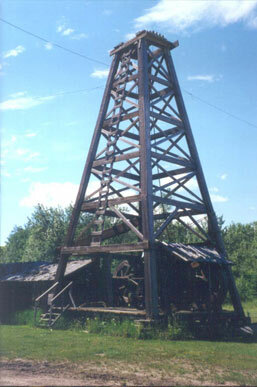 After drilling a 640 foot Exploratory well, this American Cable Tool Rig built in Erie, Pennsylvania, was abandoned in 1919 on a drilling site at the junction of the House and Athabasca rivers when an early Edmonton-based oil company went bankrupt. A copy of the first annual report of the Northern Production Co. Ltd., founded by A.F.A. Coyne, contained not only a picture of the rig, but a photo of the view to the south taken from atop the rig. After studying the photo in 1979, Stan Kondratiuk arranged for a helicopter to be manoeuvred until the view matched that in the photo and then landed in the nearest open area. The rig was less than two hundred feet away! The current owner of the land agreed to donate the rig to the museum. Because the rig had collapsed, the metal parts were covered with rotten wood and overgrown with vegetation, so a metal detector was used to find many of these metal parts. Finally the pieces, moved to Edmonton by helicopter and truck, were put together under the supervision of Fin Lineham who had, as a young man, helped to build cable tool rigs. Many companies in the petroleum industry donated funds and services to help reconstruct the rig. This truck mounted, mechanical pipe-handler was used in the 1950's to off-load and load oil country tubular goods from trucks and railcars. Before it went out of service in the 1960's, it unloaded thousands of tons of tubular goods in the Pembina field. This was the first display in place at the museum. Donated by: Ertman Miller, President Miller Oilfield Hauling Ltd. This Hillman Kelly power tong and power unit pioneered the handling of casing and tubing. It's primary application grew with the development of the Pembina field in the 1950's. Donated by: Rig Service Equipment Ltd. and Slurry Cementers Ltd. 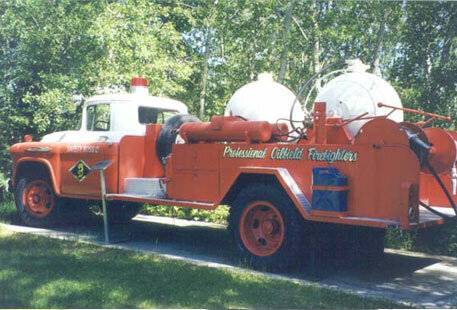 This truck mounted, well-site unit, dating back to the mid-fifties was used to fight oilwell fires. Donated by: Safety Boss Ltd. 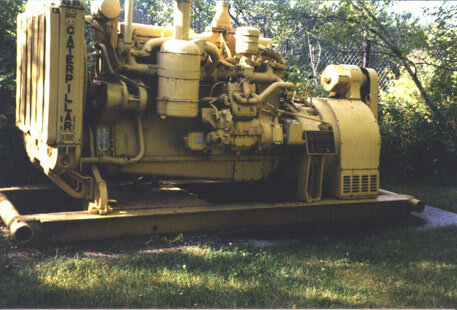 This GM diesel engine is typical of those used to power the drilling rigs of the 40's and 50's. 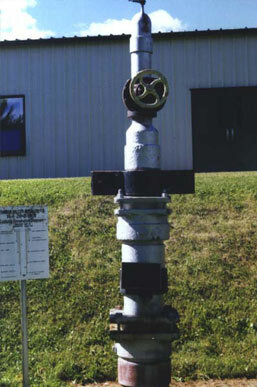 Replica of a wooden pump jack used at the turn of the century to pump oil. 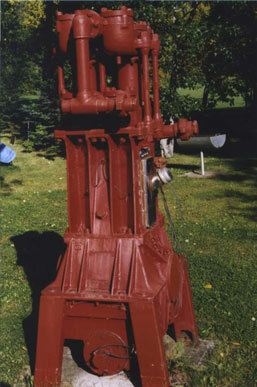 This pump was constructed by Leduc Construction using original rig parts from the 1915 cable tool rig, which is also in the museum. After a well was drilled with the cable tool rig, generally the engine, band wheel, walking beam and associated parts were left behind to pump the well. 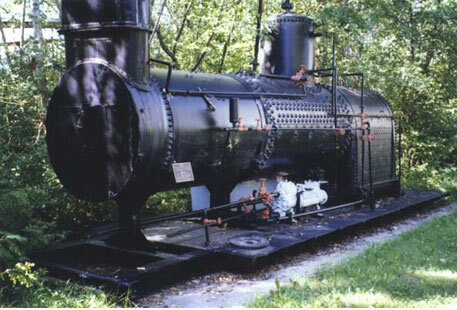 Steam engine donated by: Fleming Cats Ltd. Restored and installed by: Miller Oilfield Hauling Ltd.
Boiler donated, restored and installed by: Widney Well Servicing Ltd. 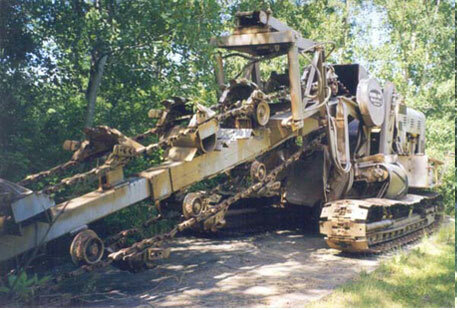 This 48' x 6' tee was used in the first 48 inch pipeline in Canada. Donated by: Robinson Piping Products Ltd. Restored by: Halldorson Welding & Construction Ltd. Installed by: Ertman Miller, President Miller Oilfield Hauling Ltd. 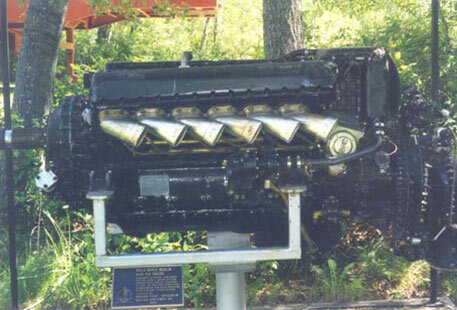 Engines like this Rolls-Royce Merlin were originally manufactured to power fighter planes during World War II. This one was adapted in 1957 to power a fracturing pumper. 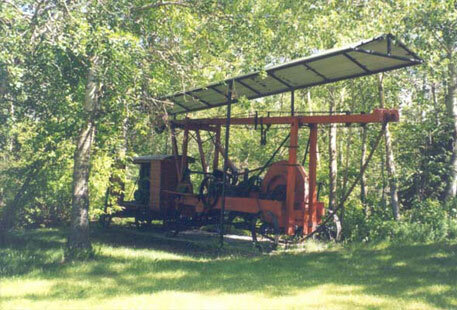 This unit was the first ever used in Canada and was used in the Pembina field, west of Edmonton. Nitrogen is used in swabbing operations, for foam fracturing, acidizing and other downhole uses. This unit was built in 1962 and is basically the same as those in use today. Donated by: Nowsco Well Service Ltd. 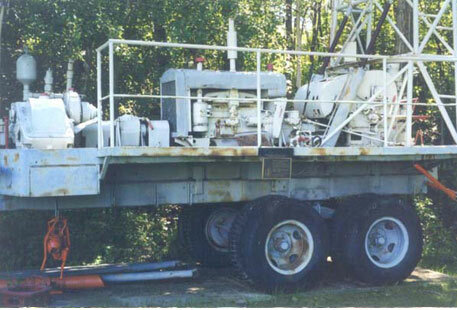 This trailer mounted, two-pole service rig with the Cardwell drawworks is typical of those built in the late 1930's and through the 40's. It was capable of drilling or servicing wells up to 3,000 foot depths. Restored and installed by: Beta Well Services Ltd. This unit was used to pump a caustic solution into the brine line at the Madison Gas Plant, which dates back to the late 1930's. Donated by: Western Decalta Petroleum (1977) Ltd. Restored by: Porta-Test Systems Ltd. 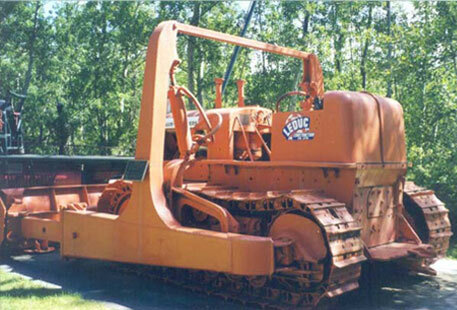 This Allis-Chalmers crawler tractor is equipped with a Baker bulldozer. Operated by Lorne Mittelstadt of Leduc Construction Company Ltd., it was used in September 1946 to prepare Imperial Oil Limited's Leduc #1 discovery wellsite. Donated, restored and installed by: Leduc Construction Company Ltd. 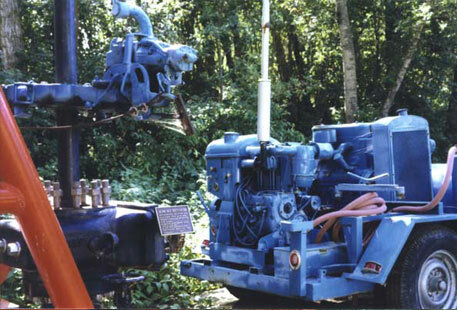 Built in 1929 for Shell Oil, this skidmounted unit typifies those used during the first half of the twentieth century to power and heat drilling rigs. 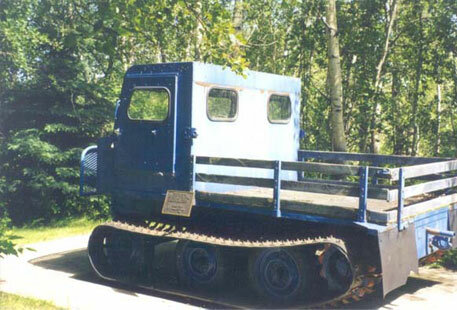 Restored by: Porta-Test Systems Ltd. & Deluxe Sandblasting and Painting Ltd.
One of the first tracked vehicles manufactured in Western Canada, this was the forerunner of many models now used worldwide. Such vehicles played an important role in opening up many otherwise inaccessible Canadian oilfields. Donated and restored by: Canadian Foremost Ltd. 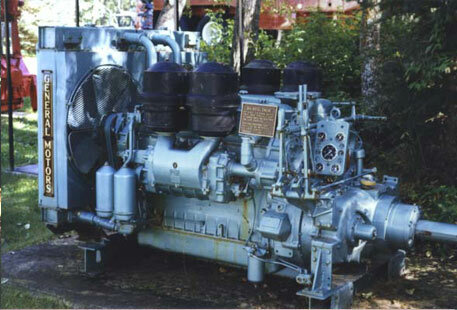 This was the thirty-fourth Lufkin Mark II pumping unit manufactured, and the fifth to enter Canada. Donated by: Canadian Reserve Oil & Gas Ltd. Restored and installed by: Lufkin Machine Co. Ltd.
Engine donated by: Shaemar Supply Ltd.
Hauling by: Kam's Sand Coating Ltd. Built in 1954 by B&W Inc., Los Angeles, California. 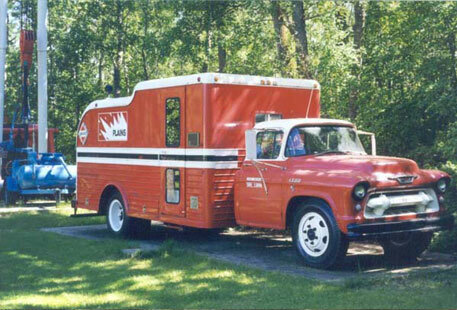 The unit was purchased in 1963 by Amoco Canada Petroleum Company Ltd. and was the first of its kind used in Canada. The unit was purchased to gravel pack the well bores in the Gregoire Lake Tar Sands project, where sand erosion was a serious problem. Gravel packing is a technique used to pump gravel down the well bore and leave it in place around the outside of a fine metal screen, which is installed through the producing interval of the well. 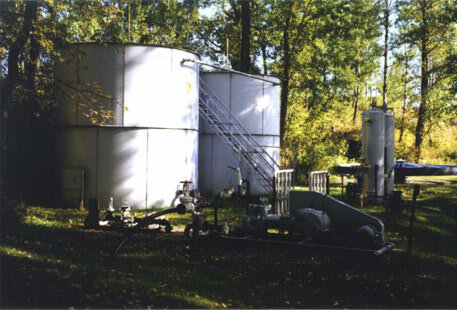 The gravel (acutally coarse sand) filters the fine sand from the production. Donated and restored by: Amoco Canada Petroleum Company Ltd. 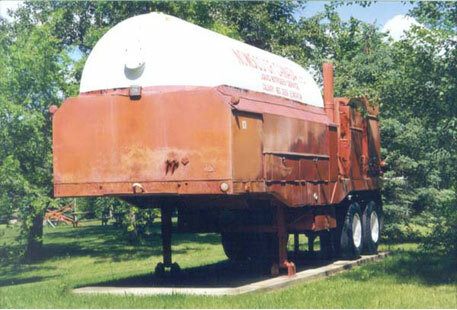 Dating back to the mid 1940's, the treater was used to separate oil, gas and water from the production of several wells. Donated by: Legal Oil and Gas Company Ltd. This unit was used on Peter Bawden's rig No. 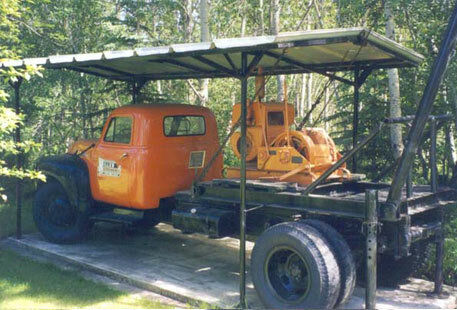 1, which was one of the rigs used to develop Alberta's oilfields in the 1940's and 1950's. Donated by: Peter Bawden Drilling Ltd. 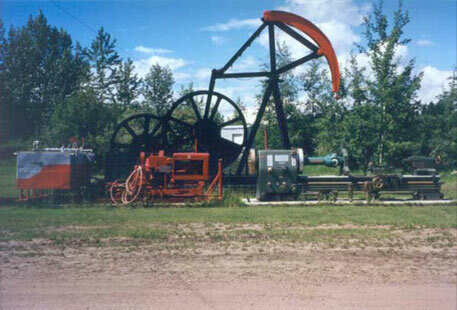 Built in the early 1960's, this rig was used to drill, complete and service tar sands wells in the Fort McMurray area. Most wells were up to 1,500 feet deep. This type of rig was used in the early 1860's in the first oilfield discovered in North America located at Oilsprings, Ontario in 1858. First wells, which were very shallow, were dug by hand to about 90 feet. As the oil formation became deeper, the spring role rig was used to depths of 400 feet. It was the forerunner to the Canadian cable tool rig, which was used beyond depths of 400 feet. 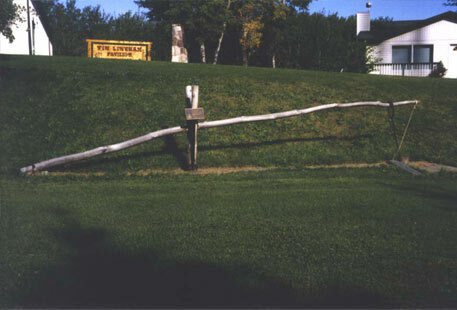 The jerker rod pumping system was used to pump up to 80 wells from one central power unit as early as 1860. 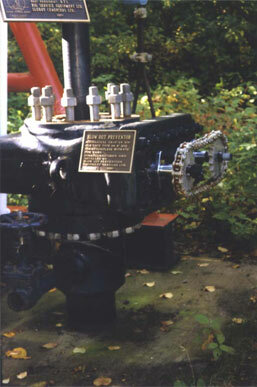 This unit was used to pump 9 wells in the Vermilion area and was installed around 1950. Donated by: Dome Petroleum and Lloydminster O.T.S. Restored and installed by: Amoco Canada Petroleum Company Ltd.
A production battery used in the early 1940's to collect, ship and separate oil, gas and water from several oil wells. It was also used to test amounts of oil, gas and water produced by each well before production was commingled. Donated by: Shell Canada Ltd., Home Oil Ltd., Mobil Oil of Canada Ltd., Esso Canada Resources Ltd.
Used since the early 1950's, this unit was used to ship oil and measure oil, water and other impurities to determine the amount of clean oil sold. Donated and restored by: Pembina Resources Ltd. 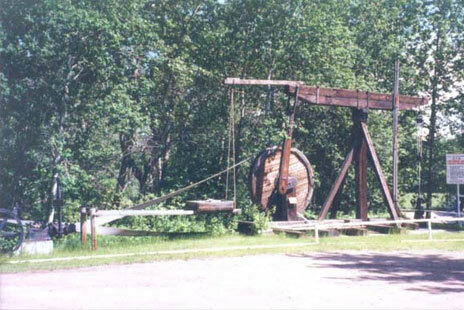 Built in 1920, this rig was used to drill water wells in the Leduc area. 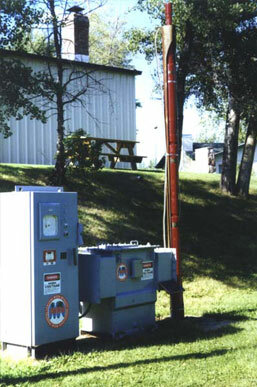 A similar rig was used by the C.P.R. when they discovered the Medicine Hat gas field while looking for water in 1883. 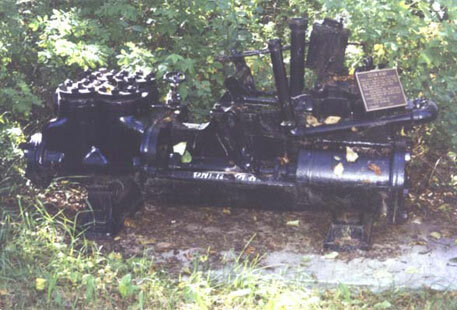 This ladder type ditcher was used from the early 1930's to bury flowlines during the development of the early oil and gas fields. Donated and restored by: Gooding and Matt Construction Company Ltd. 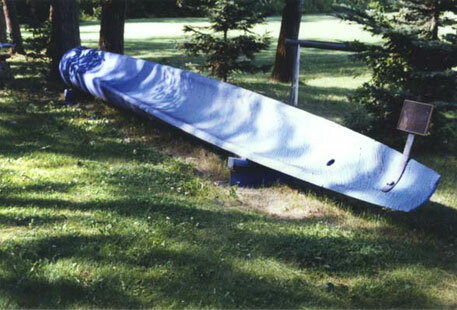 This whipstock was specially designed for use in the Beaver River Field (B.C.). Donated by: Amoco Canada Petroleum Company Ltd. Restored and installed by: Marv Helm Consulting Ltd. 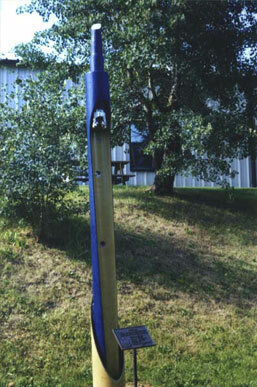 Typical retrievable whipstock used in uncased wells to kickoff direction of the well bore when sidetracking or directional drilling. Donated and installed by: Canadian Directional Drilling Ltd., a Division of Sperry Sun of Canada Ltd. 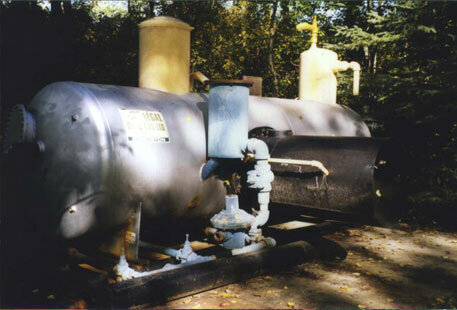 These pumps were used to pump oil, gas and water emulsions at rates of 15,000 cu. meters per day from depths of 3,700 meters. 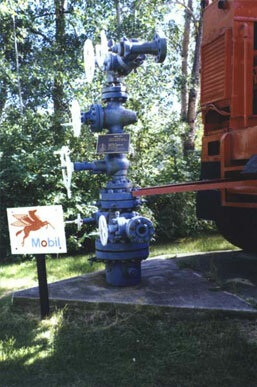 This was the first Canadian pump and was installed March 24, 1956 in the Dollard field, Saskatchewan. Donated by: TRW Reda Pump of Canada Ltd. Restored and installed by: Sandy's Light Oilfield Hauling Ltd. and R & C Machine Ltd. Built in the 1940's, this vertical pump was used for acidizing, cementing and fracing. 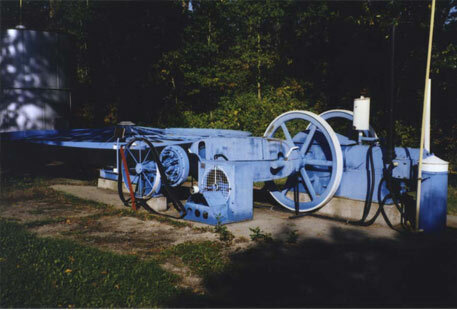 This pump was brought from the U.S.A. to perform the first hydraulic frac in Canada. Donated, restored and installed by: Halliburton Services Ltd. This is a typical casing head used during the early 1900's. Each time that a hole problem was encountered a new string of casing was run. This head was used to drill a Turner Valley well in 1918 and used 5 strings of casing. 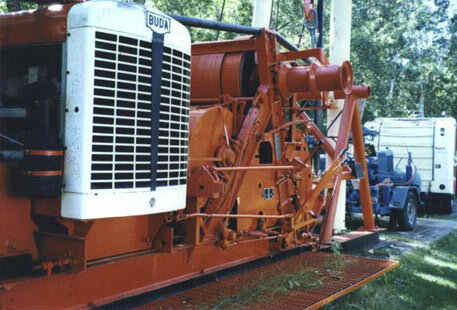 Donated and installed by: Harvey Hanlon, Kenting Oilfield Services Ltd.
A mechanical Shaffer single gate type 34 8' 900 series, complete with 5 1/2' pipe rams, this unit dates from 1934. Donated by: Blowout Prevention Equipment Services Ltd.
A typical wellhead arrangement of valves is the 'Christmas Tree' of the oil patch, not the drilling rig derrick as is often believed by people outside the oil industry. Such a configuration of valves is used to control production flow. The museum has four trees. Donated and restored by: Rector Gray Ltd. 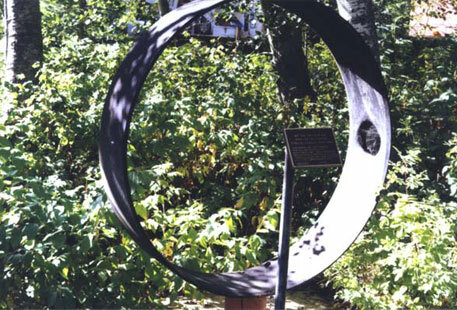 Donated by: Mobil Oil Company Ltd., Petro Canada Ltd., John Roskey, Past President, Edmonton O.T.S. and President of A.P.I. Valve Services Ltd. The latter three were all restored and installed by: A.P.I. Valve Services Ltd. 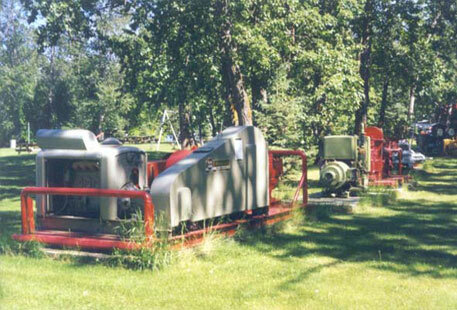 The Edmonton Oilfield Technical Society established the Outdoor Oilfield Equipment Museum in April 1979 as a tribute to the major role played by the petroleum industry in the twentieth century prosperity of Alberta. A feasibility study was undertaken by Stan Kondratiuk and approved by the OTS executive. An ongoing museum committee was set up, with Mr. Kondratiuk as chairman, a position he still holds. The museum was officially opened on July 18, 1981, with a ribbon cutting ceremony performed by the Honourable Horst Schmid, Minister of State for Economic Development and International Trade. The museum continues to grow as items of historic significance are obtained and installed. By mid-1989, fully 130 years of Canadian oil history was represented in the displays.